Please take a minute to visit updates on the Restoration page...learn how far along we've gotten...and how, after a particularly bad winter storm in late January, our oil tank shifted, broke the feed line to the boiler, and leaked a full tank of oil into the dirt floor of the crawl space. We’ve been in emergency clean-up mode ever since. If you can, please donate today to cover this major unexpected cost. We are busy working on our Summer program and event schedule - it looks to be a full and busy season! 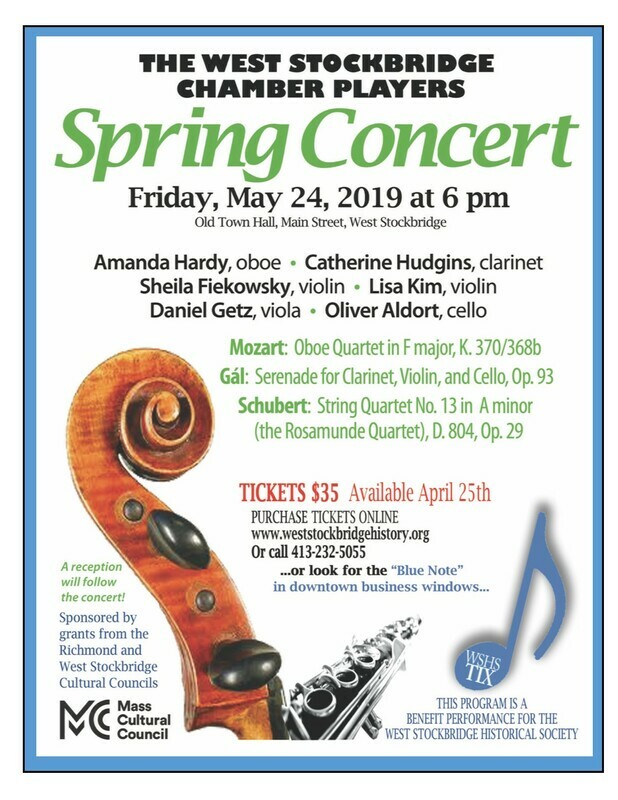 our West Stockbridge Chamber Player concerts (Spring concert: Friday May 24, 2019 at 6 pm Old Town Hall), a series of Jazz concerts beginning in August), and our Annual Housatonic Heritage Walk through a West Stockbridge neighborhood in September, just to name a few. We'll keep you posted. We also send e-blasts advising to save-the-date or tickets sales as appropriate. If you aren't on our email list and would like to be, use the contact section at the end of this page to sign up. We promise not to inundate you with emails nor ever share our mailing list. Wish to make a donation and help us restore the Old Town Hall? The mission of the West Stockbridge Historical Society is to preserve and promote the history and culture of West Stockbridge through research, programming and community involvement. The West Stockbridge Historical Society from time to time presents benefit concerts to help raise funds for the restoration of our 1854 Town Hall. The Old Town Hall was in times past a site for community events, programs and concerts, so we are proud to be carrying on this tradition. The West Stockbridge Historical Society is grateful for the generous support of all its members. and there are many benefits and interesting activities that you will enjoy as a member. If you have not already joined we encourage you to do so. Yellow House Books Baldwin's Hardware - A.W. Baldwin & Co.
*Underlined businesses link to their website ... just click.